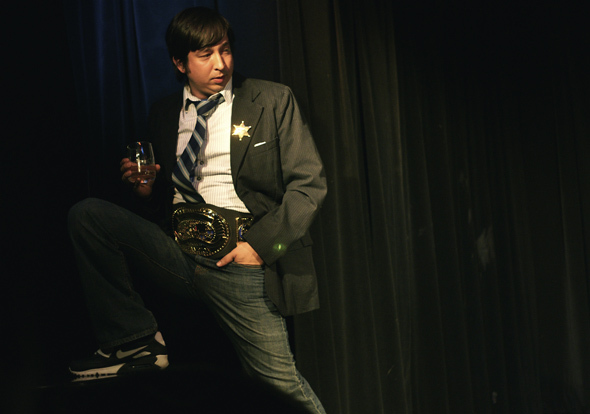 In Short: Mark Andrada is a Canadian Comedy Award Winning director/comedic performer/writer. He is One half of the performance comedy duo 10,000 to Flight, Co-founded and occasionally performs with improv troupe PROJECTproject and has toured Canada with both outfits. Favourite Theatre Credits as a Performer Include; Tat in “The Hollow -A Clown Play”(Canstage), Skeeter in “Co-ed Prison Sluts…The Musical!” (Second City Toronto, *Canadian Comedy Award Nomination -Best Male Stage Performance 2001), Felix in “Expiry Dating” (2007 Fringe Festival New Play Contest Winner) The Green Arrow in “Super Real Life” (QP/Chris Bond). Also, workshop productions of Jason Robert Brown’s Parade directed by Harold Prince, and Trey Parker’s Cannibal directed by Chris Bond. Selected Tv/Film Credits Include; Almost Heroes (Showcase), Covert Affairs (NBC/USA Network), Man of the Year, Fever Pitch (20th Century Fox), Wonderfalls (Fox), Rick Mercer Report (CBC), Life With Derek (Disney/Family Channel). Lighting Design Credits Include; Off-Broadway On Stage (Angelwalk/Toronto Centre for the Arts), Neri Flyme on the Theory of Everything (SBP/Dancemakers), Sunday Night Live! (the Sketchersons), Blastback Babyzap (Uncalled For, 2008 Toronto Fringe), Scott Thompson’s SCOTTASTROPHE (Buddies In Bad Times Theatre), Dinosaurs Unearthed (Animatronic Dinosaur Exhibit at the Detroit Science Center), and over 25 separate productions of Joseph and the Amazing Technicolour Dreamcoat (seriously). As a Director; A Small Battalion Of Soldiers (SBP/Tim Sims Playhouse, Toronto), 40 Minutes On The Wood (Blood Puppet Theatre, Calgary/Toronto), The Upside Down Widow (SBP/Playground Theatre, Chicago) Hard Headed Woman” (*2007 Canadian Comedy Award Winner – Best Solo Show), 2-Man No-Show (Audience Choice 2009 Toronto Fringe Festival), and Gary Rideout Jr.’s Beer League (2011 Canadian Comedy Award Nominee – Best Solo Show). Mark is currently touring the U.S. and Western Carribbean with The Second City.